The Texans needing defensive help in 2009 decided to address it by taking playmaking linebacker Brian Cushing with their first round draft choice from USC. USC would produce a trio of dominating linebackers in Malealuga, Cushing and Matthews Jr. The primary knock on Cushing was his durability coming out of college, but in 2008 he’d hold up for the full season and while he didn’t have completely eye-popping statistics, Brian’s versatility at both linebacker and defensive end had scouts mouth’s watering. Many teams had him pegged as the 2009 draft’s most versatile defender. An intense playmaker in game, Brian’s rookie season would be an incredible performance, as he’d come out and crush offensive players from sideline to sideline, and be named to the ProBowl finishing 2nd in the AFC in tackles. In fact, he’d also be named almost a consensus defensive and NFL Rookie of the Year by most publications. All along however, there was a failed drug test lingering in the background- one which Cushing insisted was a false positive. Once word got out and the NFL upheld its suspension, the media circus ensued sullying his 2009 accomplishments. The AP attempted to strip him of his rookie of the year awards and failed. Suspended for the first 4 games of 2010, Cushing returned to the team, (where after starting middle linebacker DeMeco Ryans went down with a season ending injury,) Cushing stepped in and start twice at middle linebacker for the team. While his 2010 season was marred by suspension Brian still managed to have a decent season finishing with 53 tackles, 1.5 sacks and a forced fumble. 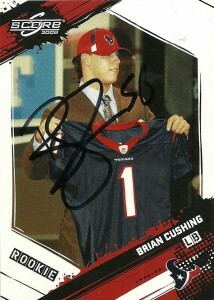 With the conversion to the 3-4 looming for Brian and the Texans, the team looks for him to do bigger things in 2011.